By the time you read this, I’ll be stood outside a cathedral waiting for my graduation ceremony to begin!! So looking forward to getting it all done as it will 100% mean I’ve finished! And let me tell you, after my hideous experience, I am done with education. I mean, if someone gave me a plate of those purple potatoes you can get now, I’d be like “Whatisthiscrap? !” but fresh blackberries are good. 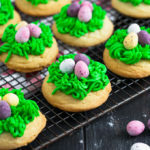 They’re sweet and juicy and mixed with condensed milk make the most fluffy, light topping ever in contrast to the rich, crisp, chocolate shortbread. 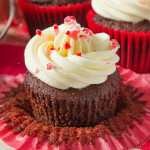 These are OH approved too – and we all know how weird he is when it comes to cake and chocolate…. So, how did I make these heaven sent shortbread bars? First of all, I made quite possibly the best shortbread I’ve ever made. It’s crumbly, I mean really crumbly – but with shortbread that’s good! Now, when you mix the “dough” it won’t form a dough at all, it will look like moist crumbs, but if you pick up a bit and squash it together, it does stick – this is perfect. You then have to tip the crumbs into your tin and flatten it right down with your hands. After baking the shortbread layer for 15-20 minutes, it’s time to add that colourful, purple filling. It’s pretty runny, but don’t fret, once baked it sets up reallllll good. 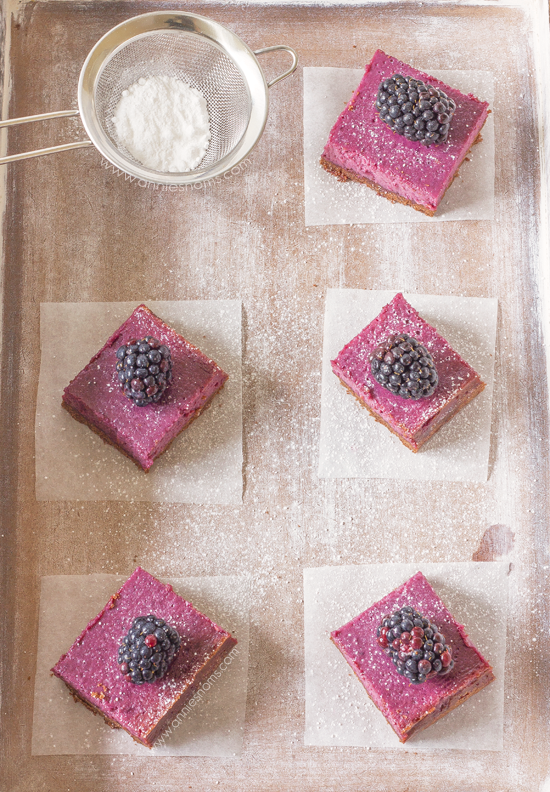 Chocolate and blackberry work so well together – the shortbread isn’t overly sweet and has a really good cocoa flavour, then the topping is delicate and sweet, which is the perfect contrast. I mean, I love incredibly sweet things, I’d pretty much bite into pure sugar, but sometimes you need that contrast and this is that time. Preheat oven to 160C/325F and grease and line an 8x8 inch square pan. 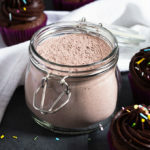 Make the shortbread first: Place the butter, flour, cocoa powder, cornflour, icing sugar and vanilla into a large bowl, or the bowl of your stand mixer and mix until you have moist crumbs, about 2 minutes on medium speed. Tip the shortbread crumbs into your prepared pan and press into the tin until flat and level. Place in the oven for 15-20 minutes until slightly crisp on top - it will also look slightly lighter than before baking. Whilst the shortbread layer is baking, place the condensed milk, egg yolks, pureed blackberries, salt and flour into a large bowl and beat on medium speed until light and smooth, about 1 minute. When the shortbread is done, pour the blackberry mixture on top and place in the oven for 25-30 minutes until lightly golden around the edges and an inserted skewer comes out with just a tiny amount of mixture on - the middle will still wobble ever so slightly. Leave to cool completely in the tin, then slice into 12-16 bars. Garnish with a fresh blackberry and a dusting of icing sugar, if desired. Bars will keep in an airtight container, at room temperature for 2 days. Thank you so much Sarah! Yes, I like natural colourings too – I often find things which are artificially coloured look a bit scary! Oh my. Seriously, you had me following with the picture alone! 🙂 Pinning and thank you! That blackberry layers looks INCREDIBLE.. love the colour especially! 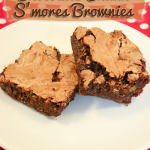 I bet these bars taste delicious too, I have to recreate the recipe! 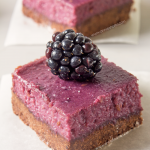 Thank you Thalia – when I first mixed the batter I was worried it was a bit black, but they baked up a lovely purple! Did you sieve the purée to remove seeds of use with seeds? I couldn’t really tell from the gorgeous photos. LOVE that you are still talking blackberries because Oregon has a long growing spell and we still have great local berries to use. Though I will admit my baking Muse is thinking more fall flavors these days. I have some marionberries to use and this recipe sounds perfect! Thanks!! Hi Linda, I didn’t sieve my purée as my blackberries weren’t very seedy at all, but if they are full of seeds, I’d advise sieving them 🙂 – I’ve turned my hand to Fall flavours now too, couldn’t hold off any longer!! Thanks, Annie. That was my best guess. 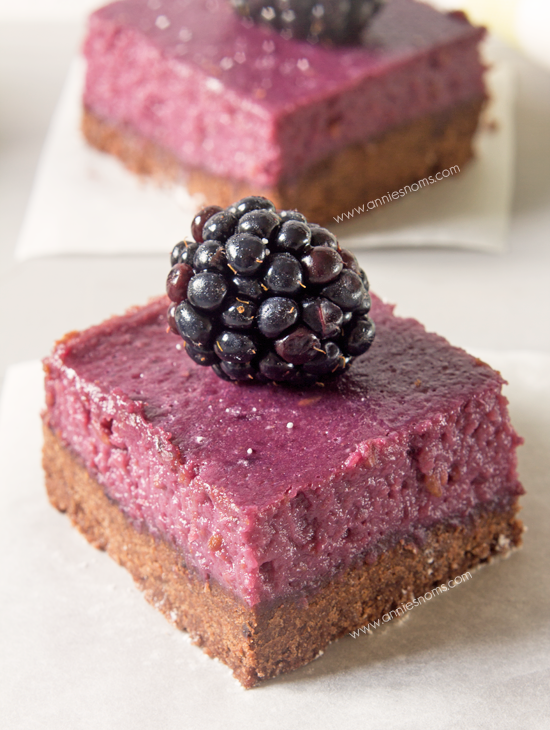 I found some amazing “steroid looking” blackberries at the market on Saturday and made a blackberry buttermilk pound cake using those but had some leftovers and thought these bars might do the trick. In the end my friends ate all the leftover berries but there is always another market this Saturday. HAHA Make bars while the local blackberries are still here! 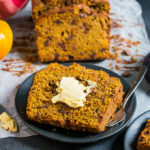 🙂 But I have to say that new blondie recipe with pumpkin is right on too. I so feel fall. Thanks!! 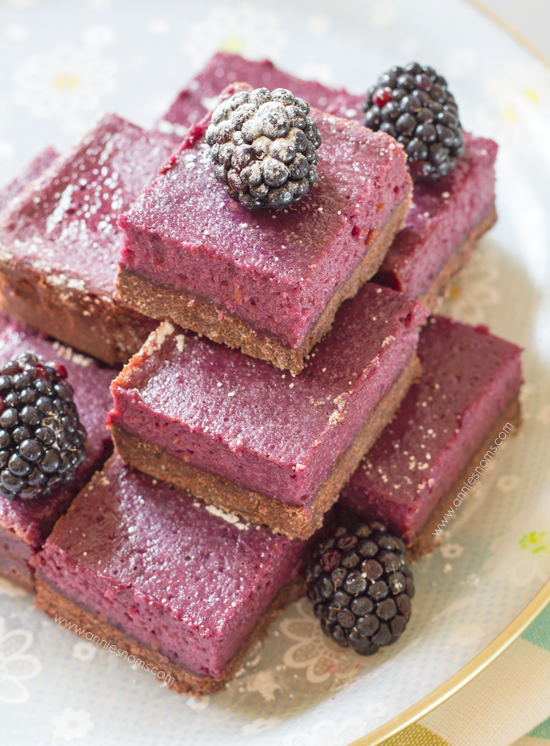 Your chocolate blackberry shortbread bars are gorgeous and I am sure they taste equally as delicious! I definitely want to try these! Congrats on your graduation! Pinned! OMGosh yum! They look so pretty! So appetizing…love the color. Pinned. Aww thank you Mandee! I’ll head on over and link up now! 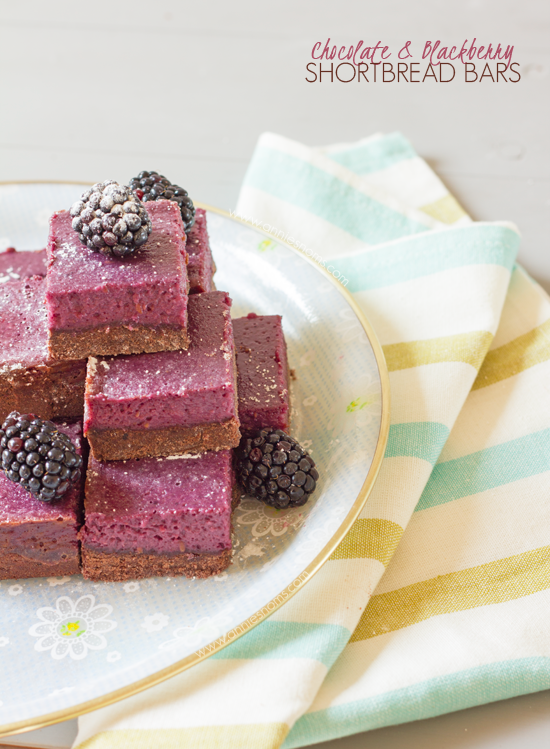 Your Chocolate Blackberry Shortbread Bars are just beautiful, and would be delicious! Hope you are having a great day and thanks so much for sharing with Full Plate Thursday. 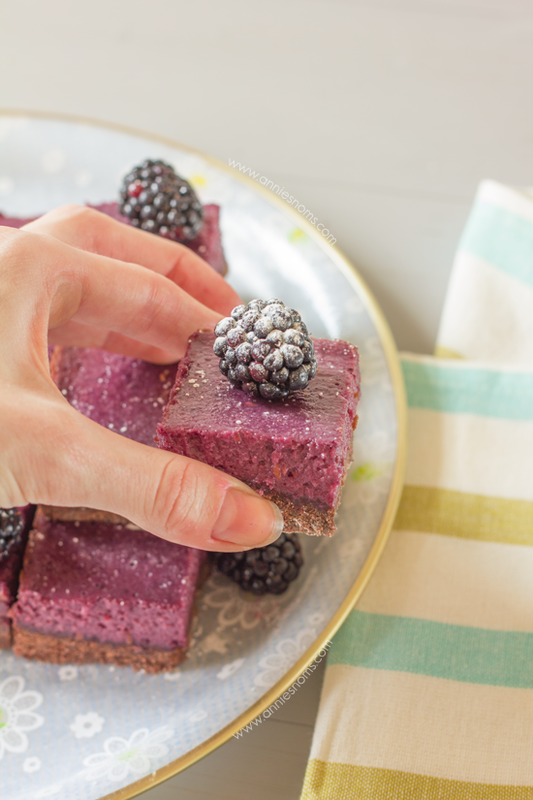 Your Chocolate and Blackberry Shortbread looks beautiful and I am sure they taste amazing.Thank you for coming by to Foodie Fridays and sharing this week. Hope to see you again on Thursday. Thank you! I was a little worried before baking as they were almost black, but they did turn out to be quite pretty!! Great color- I love blackberries, just popped over to check out your site. 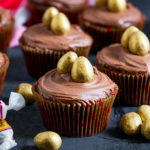 These look fantastic, my boys would love them! 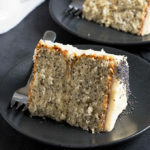 This looks like a great recipe to try – adding it on Pinterest, and glad I found it at the Turn It up Tuesday Linkup #51. Beautiful photography also! These are beautiful! I’d like to try them with raspberries. Pinning!